We consider real-time music notation to be any notation, either traditional or graphic, which is created or transformed during an actual musical performance. However, the term has not been standardized, and various articles in this issue refer to real-time music notation using other terms, such as dynamic music notation, live scoring, virtual scoring, and reactive notation. 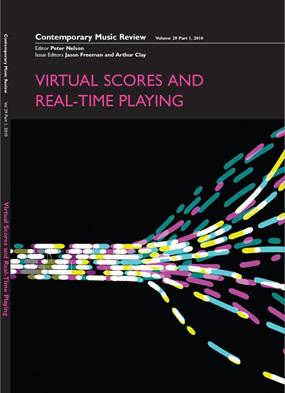 This issue seeks to convey current real-time notation practice through contributions from prominent musicians and researchers, exploring key questions from technical, musical and design perspectives in order to provide a survey of various approaches, their realizations, and the styles of music that have emerged. How does real-time notation relate to earlier experimental methods in open-form and malleable musical scores and in computer-assisted composition, and how does it further facilitate the exploration of the connections and boundaries between composers, performers and listeners? What software and hardware tools are available to create real-time notation systems, and what design challenges do composers face in creating real-time music notation that performers can sight-read in concert? Finally, how can real-time notation dissolve the divide between performers and audiences, and what possibilities exist to use real-time notation to create more engaging environments for audience participation? The editors and authors hope that the articles in this issue will spark interest in these topics and that discussion of the questions raised here will further the development of a community of practice around them. We also hope that this issue helps raise awareness of this relatively new area within contemporary music circles and that it helps attract new people to this exciting field.